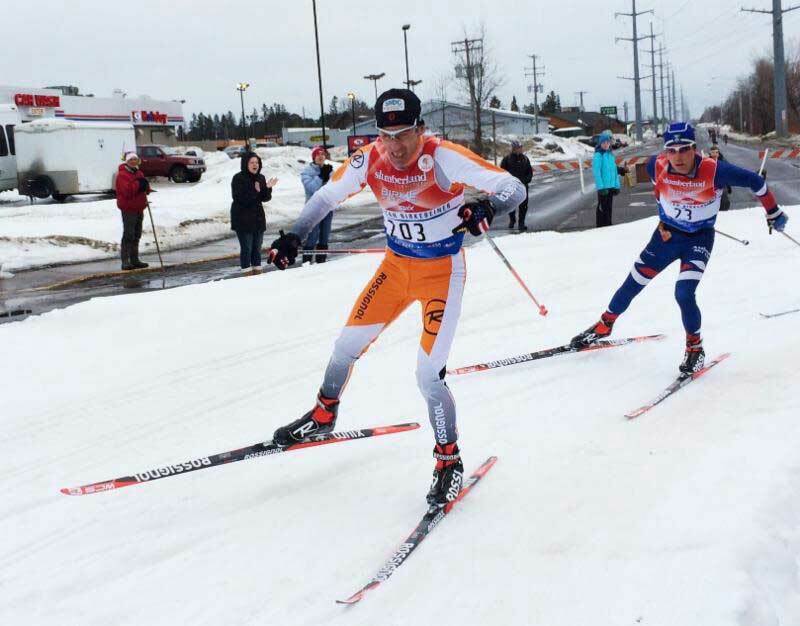 The American Birkebeiner is truly the "Super Bowl of Skiing" and the 2016 American Birkebeiner Ski Foundation (ABSF) schedule of events did not disappoint the 12,000 skiers who flocked to Hayward, Wisconsin to enjoy the festivities and trails of the North Country. The crazy weather was a different story; it caused a bit of stress for skiers, coaches, and wax technicians, including the Central Cross Country Skiing (CXC) wax team of Karmen Whitham, Marty Donegan, and Bruce Manske. The glide wax was the easy part of Birkie waxing. We cleaned the ski bases with Toko LF Blue (-30 to -10 C); although the LF Blue is a hard wax, it aids in harden the base of a ski, and makes them run faster in transformed snow conditions; and, fluorine Tribloc acts as a bonding agent for Top Finish products. Next, we applied a two layer of a 1:1 mixture of Toko HF Hot Wax Black and Toko HF Hot Wax Yellow (-6 to 0 C). The Black is very similar to the temperature Toko HF Hot Wax Red (-12 to -4 C), except the Black contains DLC additive for maximum dirt repellency. The Birkie groomers did an awesome job of preparing the course, but due to the thin snow cover and rainy weather, the course had a fair mount of dirty snow. Therefore, it was important to apply a double layer of wax. Toko HF Hot Wax Yellow has selected because of the high-fluorine content and its very durable, which aids in repelling water and dirt, and makes for fast skis. The CXC wax team top coated each ski with JetStream Bloc 2.0 Yellow. The JetStream was crayoned on across each ski and then melted with a Fiberlene-covered iron. A very thin second coat of JetStream was then crayoned on the skis. This layer we rubbed into the ski with a dedicated cork; followed by lightly brushing with a soft nylon brush and polishing with a Toko Thermopad. The JetStream improved the speed and glide of the skis due to its high abrasion-resistant design. The kick wax was challenging for most coaches and wax technicians due to the weather conditions, which included precipitation throughout the day, along with a glazing track, thousands of skiers, and the marathon distance factor. The CXC waxing crew, lead by Karmen Whitman, decided to use a combination of Toko Klisters. Nordic Base Klister Green was applied to the skis as a foundation layer; this was followed by a 1:1 mixture of Nordic Klister Yellow, designed for moist snow, and Nordic Klister Red, which has a wide range and is designed for transformed snow; Red is often used as a universal application. We tested covering the Klister with several different hard waxes, including Toko X-Cold; the hard wax cover had limited success, and we decided to primarily remain with the Toko Yellow and Red Klister combination. In a few cases, we added an additional layer of the Yellow/Red for additional kick, along with extended the Klister zones. Another test, with limited success, included adding a layer of a universal Silver Klister. Yes, the freeze and thaw conditions of the trail, and the changing conditions between coarse and transformed moist to wet fine grained snow created a variety of challenges. Alice Flanders led the CXC women's team in 10th in the 52k freestyle Birkie and Hillary Patzer finished 44nd. In the 55k classic Birkie, Nicolette Reker led the CXC women with a 20th place finish. Abbie Drach won the women's Korterloppet in a time of 1:06:25.3. Duncan Douglas led the CXC men's team finishing 31st in the 52k freestyle Birkie (as a 50year old! ), with Cory Ellertson following close behind in 37th, while Chris Pappathopoulos finished 42nd. In the 55k classic, Nick Power just missed the top of the podium finishing second overall, with Andy Brown following close behind in fourth. This year I was the only one of the Sugar Bowl to do the Birkie. Here are a couple strategies I used to have competitive skis while waxing for myself. The first thing I did was to apply my LF Moly layer at home before flying. This meant one less layer of waxing to do on Friday night. One great thing about the Birkie is the huge amount of testing and recommendations made public for the race. On Friday, I focused on getting a nice easy ski, with some pickups, to get ready for the race as well as eating a lot of food. After reading through the wax reports Friday afternoon, I wax my two wettest pairs of skis with Toko HF Yellow and Toko Jetstream Yellow Powder 2.0. I also applied a fairly aggressive structure pattern. The morning of the race I tested the two pairs of skis I waxed the night before. Once I picked the faster one I sprayed it down with Yellow Helix 2.0 and was ready to go. If you are traveling without a wax tech, there is a lot to be said for using wax recommendations, keeping the number of race morning wax decisions reasonable, and making sure you are physiologically ready to go.